Our bread-and-butter is still the manufacture of bags, tubing, and sheets in a variety of shapes and sizes. From moisture barrier bags to static shielding bags, we have the machines and skilled packaging professionals to find the solution to your packaging challenges. We specialize in custom orders! We are flexible packaging converter and we can convert any of our materials into bags, tubes, sheets, or even gusseted custom fit shapes. You provide the dimensions, and our team of packaging specialists can do the rest. Please let us examine your individual situations and help to protect your shipment or inventory from harms way. Call us at 1-800-644-4032 or send us a message via our online form. 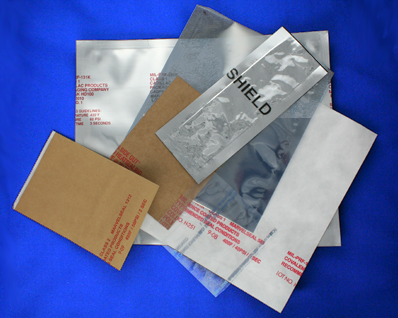 With high-speed, automatic pouch machines that can seal, cut and fold thousands of bags an hour, to a staff with the ability to hand make covers and materials to protect a fleet of Hum-Vs, Protective Packaging has the knowledge and ability to perform any job that concerns corrosion or weather related issues. From fortune five hundred electronic manufactures to the United States Marines, we have manufactured protective products that go out to every corner of the world. Our bags protect a variety of products: MREs, clothing, bombs, computer chips, car parts, and fireworks to name a few. If you have an issue with the preservation or protection of your inventory, please give us a call and we’ll help you find the solution.